Yep. Falling back is not so much fun once you are a mom. Hudson didn’t get the memo that you were supposed to sleep an extra hour. Neither did our cats. So we spent the morning watching the Disney channel, eating pancakes AND bacon, and refusing to nap. Fun times. Next year my husband and I have already decided that we are going away for the weekend and letting grandma and grandpa watch the kiddo. Did you enjoy your extra hour? Please someone tell me they did…I’ll live vicariously through you. Haha, you took the words out of my mouth mama! By the way, your Thanksgiving decor looks super cute! I can't help you out at all with a pleasant experience. She got up an hour earlier, and then refused to nap alllll day, and then she was up at 5 this morning. Not a fan of DST anymore. I really like your give the kid to the grandparents next year idea – good plan! we managed to keep Callie up about 45m late and so she was only up 30m early yesterday… today she apparently decided to let it affect her and was up 90min early (read 4:30am)!! It's going to be a long morning to get to our noon nap time! We had his First Birthday party on Saturday so we were exhausted Saturday night! 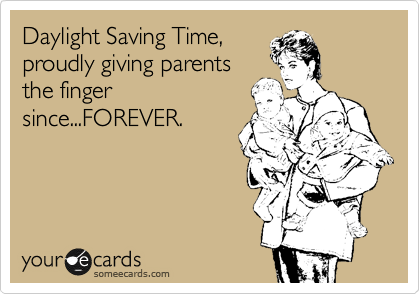 Then not getting that extra hour was brutal! Thankfully my husband watched him and let me sleep… What a guy! we were in hawaii last year for the time change. It ended up being perfection and not affecting us at all. . .next year i'm singing up for that again! Haha love this! I'm so sorry Hudson and the cats didn't get the memo. Kennedy stayed the night with her grandma Saturday night and I was completely home alone so I got some AWESOME sleep!!! Poor mamma!!! Owen, uncharacteristically, has slept until 6:30 each of the last two mornings, which be like 7:30 before the change. I was super nervous about the time change but my 8 month old got the memo and slept in. She was awake at her normal time but played for a bit and fell back to sleep. She didn't nap well but daddy got to deal with that! He gave me the day off to go out to lunch and go shopping. Ha! We happened to be out of town so grandma and grandpa definitely got the short end of the stick on this one! I'm in the same boat as you! You're not alone. At least we can all ban together! My little guy was up at 5am so no extra hour here either!! Weekend at the grandparents sounds like a great idea for next year. I'm right with you! 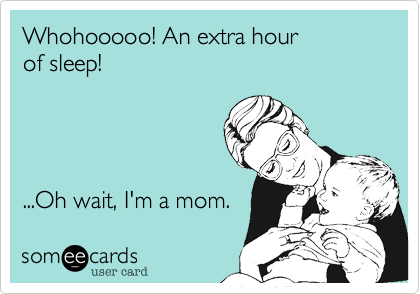 Aiden didn't understand this fact about sleeping an extra hour either! Grandma and Grandpa would love to give you time off…………we don't even need a time change. That sounds like a great plan! We got lucky and some how Owen did get the memo and slept till 8?! We were absolutely shocked! But pancakes and bacon plus cartoons still sound like a pretty good Sunday morning! Oh I feel ya!!! We'll probably get Arden adjusted just in time to go to Florida this weekend and then go back to the old time. Greattttt! Ugh, I had to work a night shift, so I had to stay awake for the extra hour! Awful!!!! And my daughter missed the memo too about sleeping the extra hour. Oh my goodness. 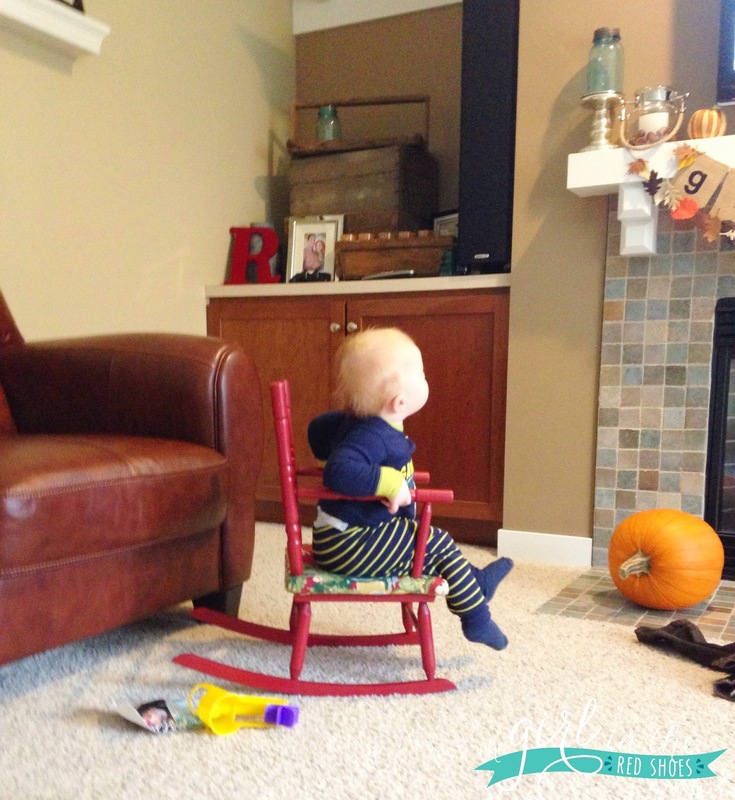 That little chair is the cutest thing I've seen in awhile! oh man this is spot on! ugh.